March 18, 2017. Come celebrate Caldwell, New Jersey’s own, President Grover Cleveland’s 180th birthday anniversary, by attending an authentic White House Tea Social, hosted by the President and First Lady Frances Folsom Cleveland, to be held at the Undercroft of St. Peter’s Episcopal Church, 271 Roseland Ave., Essex Fells, NJ, on Saturday, March 18, 2 to 4 PM. Dine on delicious tea cakes, sandwiches, scones, and freshly brewed teas served by hostesses in costume of the period – in style with the traditional Victorian Era and modeled after actual White House receptions. In addition, an informative talk on “Fine Dining in the 19th Century” will be presented by noted historian and professor emeritus of Drew University, Dr. David Cowell. To enhance your experience, there will also be on display for the very first time the newly acquired, rare wax museum figures of the First Ladies – Rose Elizabeth and Frances Folsom – who served in President Cleveland’s two terms (1885-89 & 1893-97), each outfitted in their inaugural finery. 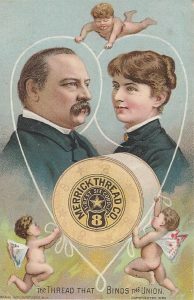 Additionally, specially selected collectible items from the Grover Cleveland Birthplace Museum Shop will be presented and available for purchase. This special presidential birthday Tea Social event aims to foster the legacy of President Grover Cleveland and raise awareness of the mission and accomplishments of the Grover Cleveland Birthplace Memorial Association (GCBMA) in our community. Make your reservations early as seating is limited by notifying Alice Gibson at gibsonalice30@gmail.com or calling 973-228-1293. Tickets are just $30 per person, made payable to “GCBMA”, and mailed to 14 Kramer Ave, West Caldwell, NJ, 07006. This entry was posted in Event on February 20, 2017 by Kevin Hersh.